Pfc. Billy R. Henry, son of Mr. and Mrs. W. G. Henry, attended Hollister High School; husband of the former Thelma Jean Moran. 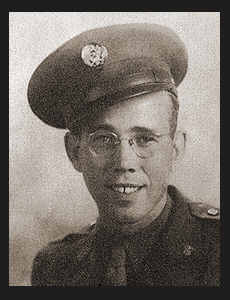 Entered Army in Aug., 1942, trained in Camp Swift, Texas, Camp Young, Cal., Camp Polk, La. and Ft. Devens, Mass. ; served in Switzerland, England, France, and Germany, Awarded Bronze Star, Am. Theatre Ribbon, EAME Ribbon with one Battle Star, Good Conduct Medal.